Catch them while you still can. Waiting for the storm to pass. Feels like Cod time again. The next day or so should be ideal conditions for Cod on Chesil again. After a windy weekend, it looks like the wind will back off for a few days, before it comes back with a vengeance on Thursday afternoon. The water is pretty well stirred up at the moment, but as the wind drops and switches to the NW on Tuesday afternoon the beach will be almost perfect for the Cod and Bass to move close to shore. When the conditions are nice and coloured I prefer to use fresh Lugworm, fished about 70yds out on a Pulley Pennel Rig with 5/0 hooks. I know I keep going on about the summer species still being around, but it is well worth still trying for them. I have had quite a few Bream over the past couple of weeks and last week I had loads of Garfish. With this in mind I have decided to release a video I was going to keep until next year, it is a quick guide on how to catch Garfish. This is just one of many new videos I have been working on over the past year. I am hoping to releases one a week, when we launch the new look website in a few weeks time. Now that the clocks have changed again and the nights are getting longer, I have prepared a couple of articles this week that will be featuring night fishing and headlights. Chesil Beach: rough with 1.5m waves and coloured water. Portland: 2m waves, with lightly coloured water. Chesil Beach forecast: With tides building towards Springs and the water coloured, conditions should be close to perfect for Cod and Bass. I don’t expect to see any monsters but I would expect plenty of Codling. As the water clears you should have the chance of Bream and Garfish. Evening sessions should produce plenty of Whiting and Dogfish. Portland: The Wrasse fishing is now coming into its peak, with the fish in prime condition and looking to feed up for winter. The next few weeks are when you will have the best chance of a big Wrasse. Most of the larger wrasse fall to crab baits fished hard on the bottom. Rotten Bottoms are essential if you have any chance of getting them back. Hard back Velvet swimming crabs and Hermit work really well for the big Wrasse. I hope to see some more Pollock around the Bill, especially on lures. Portland Harbour: The harbour is fishing very well at the moment for Bass and Flounder. I have had several reports of good numbers of Bass up to 5lb from all along the shore. Weymouth Bay: Both the Stone and Pleasure pier will offer reasonable shelter and the chance of picking up a variety of species. Preston will give you an opportunity to pick up a few species and the chance of a bous Bass. It will also offer some shelter when the wind picks up. 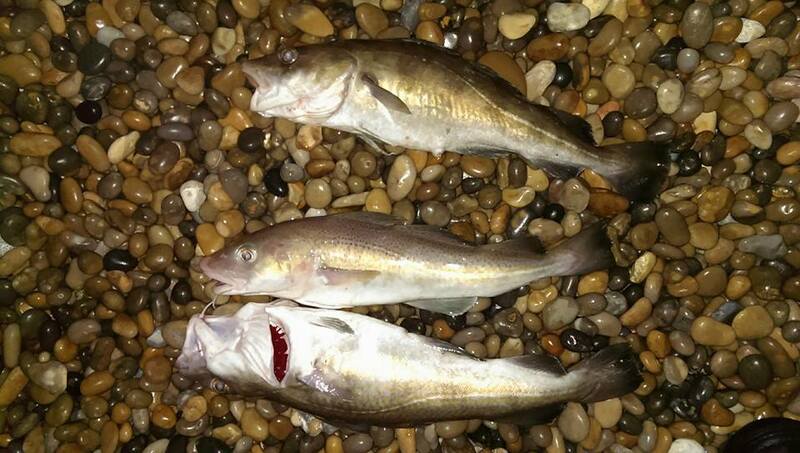 Fishing Tails > All Articles > Reports > Chesil Beach > Feels like Cod time again. One Response to "Feels like Cod time again."